View More In Chafing Dishes. 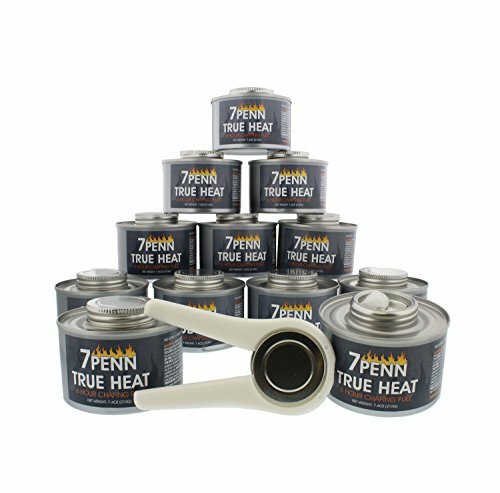 Keep food hot and safe for all buffet, catering, and foodservice occasions with the 7Penn 6 Hour Cooking Fuel 12-Pack with FREE Lid Opener. These 7.4-ounce cans warm chafing dishes for 6 hours with sustained temperature. Lower quality Sterno (gel-type fuel) cans last only 1 to 2 hours with no steady or controlled flame, but each of these cans are filled with a liquid fuel and include a wick sealed into the top of the can (like an oil or kerosene lamp) which gives them a long burn time and produce a steady, controlled flames. Other fuel cans are difficult and painful to open, but this package includes a FREE opener tool to quickly screw off the top lid for immediate use and just as easily replace the lid to store for later use. WARNING: This product can expose you to chemicals which is [are] known to the State of California to cause cancer and birth defects or other reproductive harm. For more information go to www.P65Warnings.ca.gov. If you have any questions about this product by 7Penn, contact us by completing and submitting the form below. If you are looking for a specif part number, please include it with your message.